July is clearly the month to celebrate French food. Not only is Bastille Day July 14th, but the United States owes its independence to the help of our close allies, the French (who, lets be honest, didn’t actually care about us but really wanted to screw over the British). Combine that with all the lovely fresh summer food, and you really need to just embrace the glory that is French cuisine. One thing I’ve always liked about French food is that they really do appreciate fruits and vegetables. Also desserts. 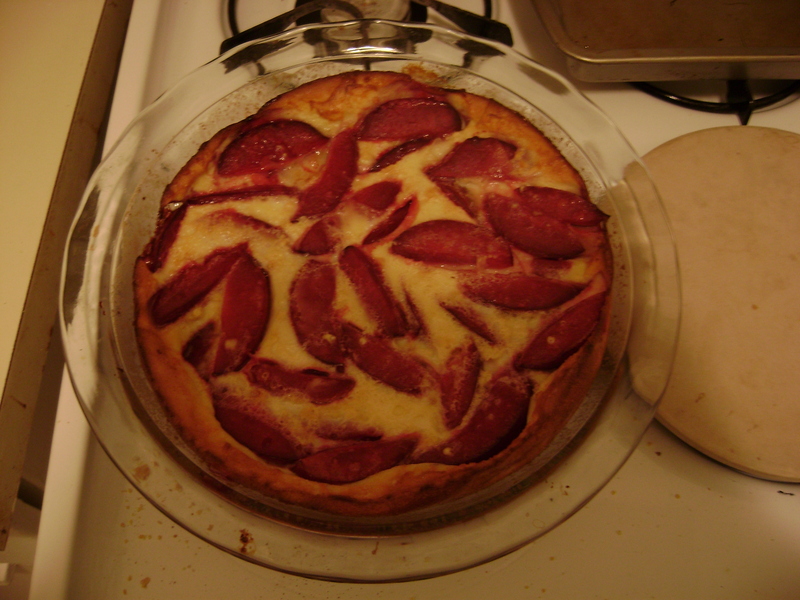 So I tried a combination of the two: a french fruit dessert, called Plum Clafoutis. I’ve actually already made this twice, I loved it so much. I might make it again in the very near future. As per usual, it comes from the Flour bakery cookbook. Its a fairly simply concept. Butter a dish – I used my trusty pie plate. Chop some plums, coat with sugar, and put into the dish. Then mix eggs, milk, sugar, flour and vanilla together and pour it over the fruit. Bake untl golden brown. Cool a little, sprinkle on powdered sugar, and serve warm. This turned out much softer than I expected, not that I suppose it would make sense not to be soft. Its kinda like a custard or a souffle or something similar in consistency. It is incredible though. The recipe suggested eating it warm, but eating it cold, for breakfast the next day or two is also amazing. I really like plums, so this recipe is pretty much perfect as is, but I have a sneaking suspicion this could be adapted to work with other fruits. Perhaps peaches or apricots. I’ve never been overly good at following directions (just ask my best friend the number of times I got us lost while driving). This can be both good and really bad in a cook. Everyone says that baking in particular requires precision and exactly following the instructions. Which I try to do, it just doesn’t always quite happen that way. For this week’s cooking adventure I decided to attempt brioche. The recipe said to make loaves first as a way to “practice your technique” before moving on to more complex things. Naturally, I was intimidated and told myself I would follow directions. Well, first it told me that I shouldn’t halve the recipe, as it wouldn’t come together right … I made a half recipe. 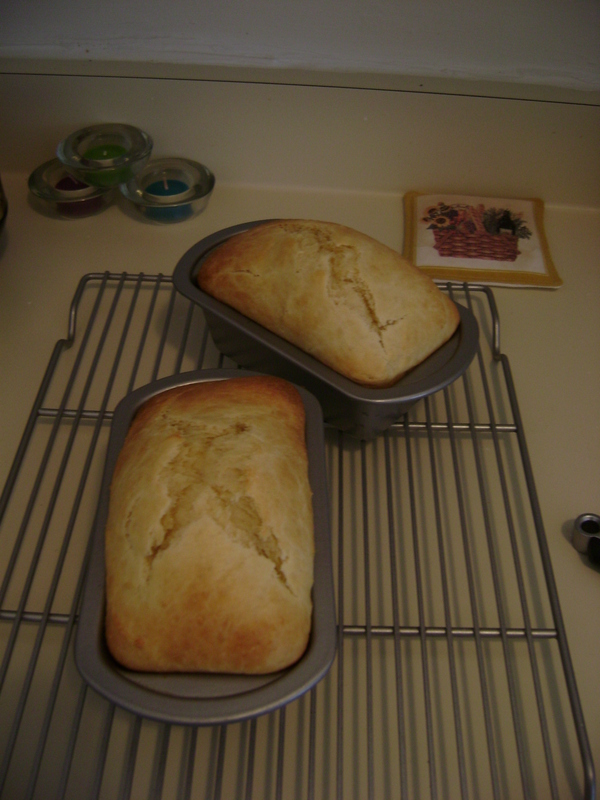 Second, it said to dump 2 1/4 cups flour, 1/3 cup sugar, 3 eggs, and 1 package yeast into a bowl and mix with dough hooks. Then add the butter (about 10-11 tablespoons) slowly until it all comes together. I don’t have dough hooks. My mixer was a cast-off from my parents that may be older than I am. I got it because the dough hooks broke and they bought a new one. So I hoped that normal beaters would work. They didn’t. The dough was too thick and sticky by the time I started add the butter and covered the beaters. Rather than continue with the beaters, I mixed it all by hand (by that I mean with my hands). Best decision ever! So much fun to mush soft butter into a lovely dough and knead it. Then I set it in the fridge to rise overnight. The next morning, I pulled the dough out of the fridge – it was cold but pliable. The recipe said to roll the dough into a square and fold it so that it fits the loaf pan (I use 2 small loaf pans over one large one). I just kinda molded it into the right shape and squished it into the pans. Then I baked it for about 30 minutes. Let cool in the pans for a bit and then on wire racks. The result: Unbelievably delicious. Like crazy good. The closest thing to a problem with it is that it is completely and utterly addictive. Also, it dries out quickly so you should eat it within three days of baking it – which again isn’t a problem per se unless you are watching your weight. 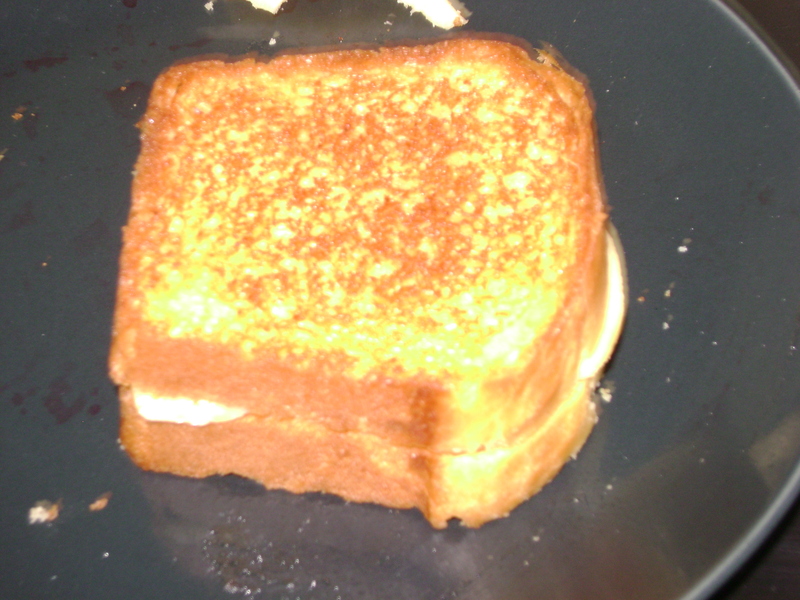 One other important thing to note – it makes incredible bread for grilled cheese. I have spent years trying to find the ultimate grilled cheese sandwich and it is down to two contenders: cheddar on sourdough (preferably SF sourdough) and gouda on brioche. Its quite likely that gouda on brioche wins … but I have a deep attachment to sourdough in general.